You can add beautiful pigment to all of our finishes! 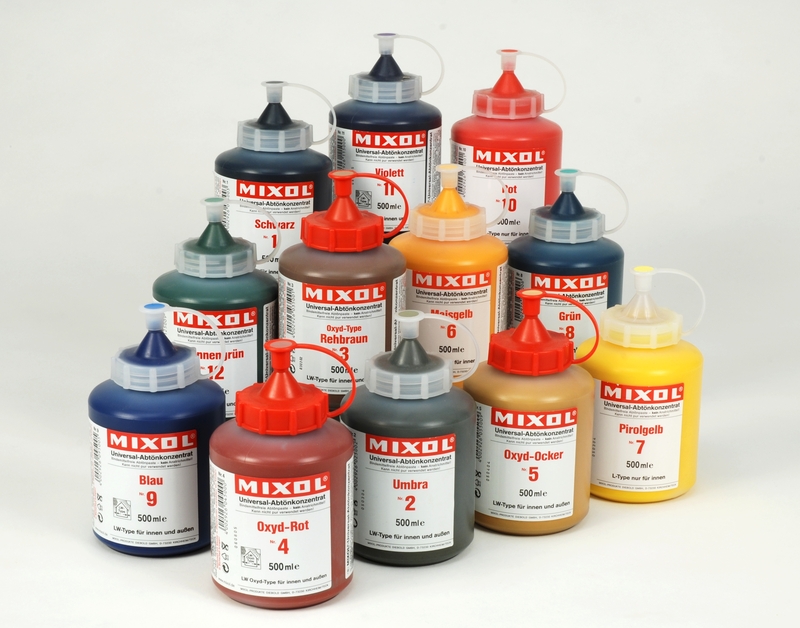 We now carry Mixol Oxide universal pigments for sale for both your color and oil needs! Mixols are the highest quality Universal Tints on the US market today. 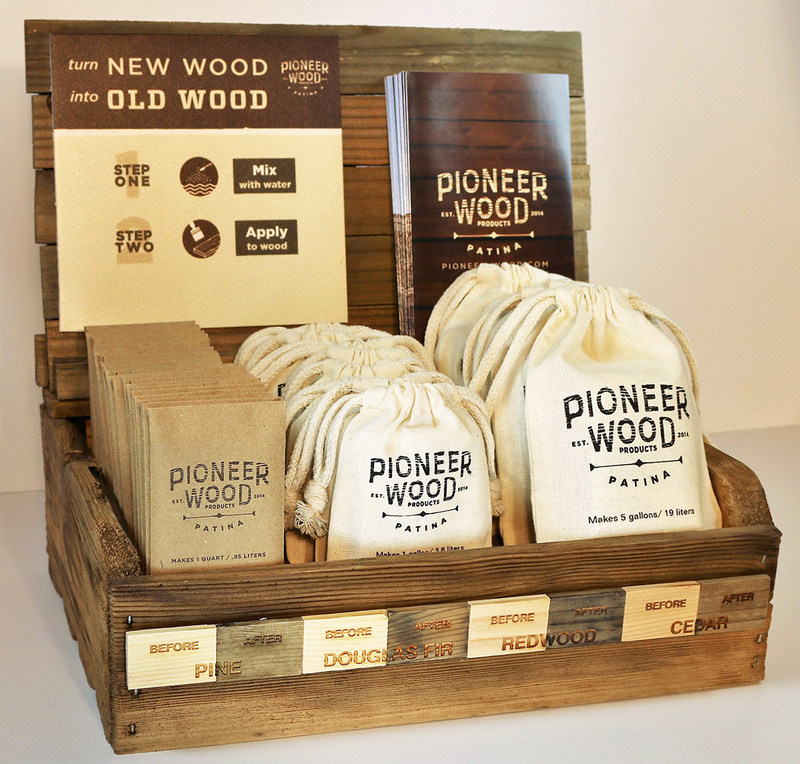 They have been produced in Germany for more than 35 years and are highly compatible with all the Heritage Natural Finishes products and we love them! Mixols are known for their high concentration of pigment, sophisticated color palette, and ease of mixing. They are highly resistant to frost and heat damage, which makes them ideal for adding to our finishes for exterior applications specifically. They have an indefinite shelf life- they will not dry out or thicken, because they are binder-free. The oxide-based colors are made from inorganic pigments which make them colorfast, fade-resistant and weatherproof which make them ideal for exterior applications or where UV fading may occur. Mixol tints are not flammable or hazardous. We offer the oxide tints in three sizes: the small 20ml test sizes, along with standard 200ml and industrial 500ml bottles. * To add Mixol Oxides to our finishes, simply add the pigment at your desired intensity directly into our oils and mix very well (shaking works the best we’ve found!). A good ratio starting point is 12 oz of Mixol added to 1 gallon of Heritage Oils. This gives you the strongest color before acting like paint (so you can still see some wood grain at this ratio). The Mixol Oxide tints are the richest and highest quality we’ve found, so I think you’ll be impressed and love the expanded color options while still working with our natural oil finishes. Feel free to contact us for more information. Cleanup of the Mixol pigments is very easy, just use soap and water. Once the Mixol is mixed into the oil, use Pure Citrus Solvent for clean up. * LOOKING FOR AN OLD GREY / BARN WOOD LOOK? 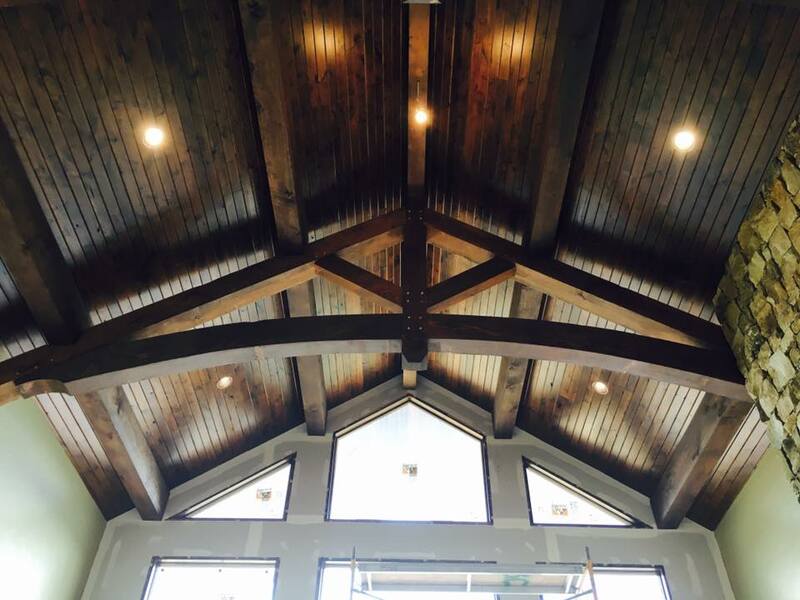 If you are looking to tint your wood grey or want it to look like old barn wood, you can also try using Pioneer Wood Patina to turn the wood grey, then you can oil over the top. We now carry this handy product! Click here to learn more and order. Available in quart, gallon and 5 gallon sizes. Just mix with water and apply. Mixol Universal Pigment #3 Oxide Brown. Sample size, 20ml. Made in Germany. Note on shipping cost here: If you are ordering only one of these, the online shipping generator will be WAY off! Please ignore that number and we will get you the correct shipping at the time we are ready to ship. Your card will not be charged until the correct amount is agreed upon. Mixol Universal Pigment, #4 Oxide Red, sample size 20ml bottle. Made in Germany. Mixol Oxide Universal Pigment Oxide Yellow #5. Made in Germany. Mixol Universal Pigment, #14 Oxide Green, sample size 20ml bottle. Made in Germany. Mixol Universal Pigment, #19 Oxide Camel, sample size 20ml bottle. Made in Germany. Mixol Universal Pigment, #20 Oxide Chestnut, sample size 20ml bottle. Made in Germany. Note on shipping cost here: If you are ordering only one of these, the online shipping generator will be WAY off! Please ignore that number and we will get you the correct shipping at the time we are ready to ship. Your card will not be charged until the correct amount is agreed upon. Mixol Universal Pigment, #21 OxideTerra Brown, sample size 20ml bottle. Made in Germany. Note on shipping cost here: If you are ordering only one of these, the online shipping generator will be WAY off! Please ignore that number and we will get you the correct shipping at the time we are ready to ship. Your card will not be charged until the correct amount is agreed upon. Mixol Universal Pigment, #22 Oxide Tobacco, sample size 20ml bottle. Made in Germany. Note on shipping cost here: If you are ordering only one of these, the online shipping generator will be WAY off! Please ignore that number and we will get you the correct shipping at the time we are ready to ship. Your card will not be charged until the correct amount is agreed upon. Mixol Universal Pigment, #23 Oxide Dark Brown, sample size 20ml bottle. Made in Germany. Note on shipping cost here: If you are ordering only one of these, the online shipping generator will be WAY off! Please ignore that number and we will get you the correct shipping at the time we are ready to ship. Your card will not be charged until the correct amount is agreed upon. Mixol Universal Pigment, #24 Oxide Stone Grey, sample size 20ml bottle. Made in Germany. Note on shipping cost here: If you are ordering only one of these, the online shipping generator will be WAY off! Please ignore that number and we will get you the correct shipping at the time we are ready to ship. Your card will not be charged until the correct amount is agreed upon. Mixol Universal Pigment, #25 White, sample size 20ml bottle. Made in Germany. Note on shipping cost here: If you are ordering only one of these, the online shipping generator will be WAY off! Please ignore that number and we will get you the correct shipping at the time we are ready to ship. Your card will not be charged until the correct amount is agreed upon. Mixol Universal Pigment #03 Oxide Brown. Size 200ml bottle. Made in Germany. Mixol Universal Pigment, #4 Oxide Red, 200ml bottle. Made in Germany. Mixol Universal Pigment, #05 Oxide Yellow, 200ml bottle. Made in Germany. Mixol Universal Pigment, #19 Oxide Camel, 200ml bottle. Made in Germany. Mixol Universal Pigment paste, #20 Oxide Chestnut, 200ml bottle. Made in Germany. Mixol Universal Pigment, #21 Oxide Terra Brown, 200ml bottle. Made in Germany. Mixol Universal Pigment, #22 Oxide Tobacco, 200ml bottle. Made in Germany. Mixol Universal Pigment, #23 Oxide Dark Brown, 20ml bottle. Made in Germany. Mixol Universal Pigment, #24 Oxide Stone Grey, 200ml bottle. Made in Germany. Mixol Universal Pigment, #25 White, 200ml bottle. Made in Germany. Mixol Universal Pigment, #14 Oxide Green, 200ml bottle. Made in Germany. Mixol Universal Pigment, #29 Brilliant Black, 200ml bottle. (This is the only size this color comes in) Made in Germany. Mixol Universal Pigment, #03 Oxide Brown, industrial size 500ml bottle. Made in Germany. Mixol Universal Pigment, #4 Oxide Red, Industrial size 500ml bottle. Made in Germany. Mixol Universal Pigment, #05 Oxide Yellow, Industrial size 500ml bottle. Made in Germany. Mixol Universal Pigment, #20 Oxide Chestnut, Industrial size, 500ml bottle. Made in Germany. Mixol Universal Pigment, #21 Oxide Terra Brown, Industrial size, 500ml bottle. Made in Germany. Mixol Universal Pigment, #22 Oxide Tobacco, Industrial size 500ml bottle. Made in Germany. Mixol Universal Pigment, #23 Oxide Dark Brown, Industrial size 500ml bottle. Made in Germany. Mixol Universal Pigment, #24 Oxide Stone Grey, Industrial size 500ml bottle. Made in Germany. Mixol Universal Pigment, #25 White, Industrial size 500ml bottle. Made in Germany. Mixol Universal Pigment, #19 Oxide Camel, Industrial size 500ml bottle. Made in Germany. 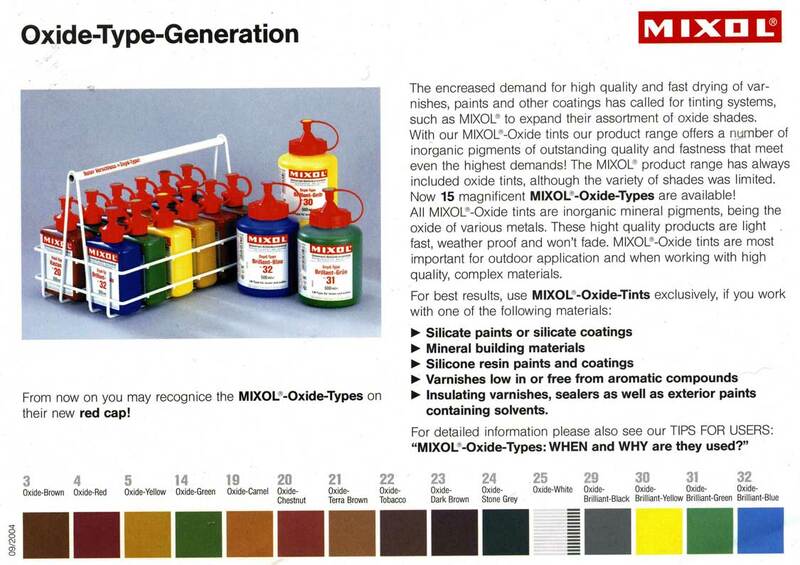 Mixol Universal Pigment, #14 Oxide Green, Industrial size, 500ml bottle. Made in Germany. Mixol #32 Brilliant Blue.